It’s time to enjoy something new, something different and refreshing, yet nostalgic and reflective all the same. It’s time to take in the ultra-meta and pop referential film that is sure to become part of the modern day zeitgeist as a reference point for years to come. Birdman marks not only the return of the dearly missed Michael Keaton, but also a piece of work that takes honest and albeit harsh and biting jabs at the state of current entertainment, both screen and stage alike. Alejandro González Iñárritu, director of the ultra gloomy 21 Grams, Babel as well as the under appreciated Amores Perros, has created a true masterpiece with this darkly comedic character study. The film opens on a levitating older man (Keaton/Riggan) in a dingy backstage dressing room at Broadway’s St. James Theatre. His back is to us as we attempt to process the illusion set before us while hearing a guttural and gravely voice bemoaning his current situation. This levitating elder is Riggan Thomson, a washed up Hollywood actor looking for late life validation as an artist in the form of a Raymond Carver stage adaptation that he’s written, is directing and staring in. His mysterious levitation/meditation is cut short by a phone call from his daughter (Emma Stone) and as the camera follows Riggan to the other side of the room, it occurs to us that there is another illusion afoot. This uninterrupted take has lasted a good while now. Soon we come to grips with the fact that this seamless long take will never end or at least not until the credits roll. We spend the next two hours roaming the bowels of the St. James, following Keaton/Riggan from one crisis to the next taking a side step here and there to spend time with a truly despicable “true thespian” in Ed Norton, his vulnerable actress wife played by Naomi Watts as well as a sensible and fairly grounded Zach Galifianakis who plays the producer/best friend and lawyer to Riggan. Not trying to suggest this is a perfect film, while at times I was asking myself if that was in fact what I was viewing. Unfortunately before it ends there are points where it was as though Iñárritu was daring me to disembark the ride prematurely and balk at the questionable CGI and absurd Birdman suit. Alas I did not and simply could not, for what proceeded it was simply too good, too daring and too well crafted to even entertain the idea of turning away. 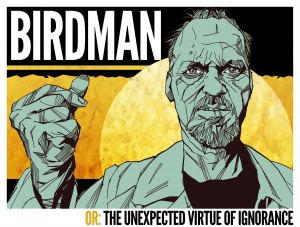 Birdman’s alternative title is “The Unexpected Virtue of Ignorance”. Ignorance as a virtue has never been unexpected for this scribbler and it is my hope and desire that I have not enlightened you to a level that you expect too much. As with all films, especially the great ones, they’re best when you’re afforded the opportunity to decipher and unravel them on your own and without the added pressure of elevated expectation. There is a lingering question that remains here well after viewing and that is, what did that voice sound like before the first Birdman? Had this been answered and had the questionable CGI been avoided this might have been a 5 star review. Regardless, Birdman is one for the ages. *Artwork by The Sunday Dog Parade. Posted on Friday, October 3rd, 2014 at 4:13 am and is filed under Reviews.